I’m sharing side dish secrets, starting with parmesan roasted broccoli for the happiest life ever. Welcome to Side Dish Sundays! Here’s the thing. I majorly STRUGGLE with side dishes. Not everyday. But still… often enough that I was inspired to share some of my favorite side dishes, if even for selfish reasons so I have a more complete list to go on. When I shared these 45 lunch ideas at the start of 2019, a few of you reached out and asked me to do so with side dishes. But the thing is… is that I don’t have enough. I don’t even have enough on here for every day life that I can use. As someone who gets bored with meals all the time, switching up an easy side dish is KEY. Making sure that we have something equally delish to eat on the side is super important. My mom was the queen of family dinner when I was a kid. Nearly every single night, she had a meal made with at least two side dishes, sometimes even three. It was satisfying and nourishing and something that I remember as a kid. I feel like it really played a role in our family dinners. And it’s not like her side dishes were super fancy or took a long time to make. But they all went together. And were delicious. I may not have a side dish to share with you every single Sunday, but I’ll share them at least once or twice a month so by the end of 2019, we can build our side dish repertoire by 20 or 30 recipes. Some may be super simple (like this one!) and some may be a little more involved (think my favorite quinoa salad). But the best part? I’ll also be sharing some of my favorite dishes to pair these with! I wanted to kick things off with a very easy, probably fairly well known broccoli recipe. In fact, a lot of you are probably familiar with this one. This parmesan roasted broccoli recipe has basically changed my life. I can eat broccoli every day thanks to this recipe! My kids eat it thanks to this recipe. The flavor is insane. There is crunch and texture. Some nuttiness and cheesiness. What more do we need? The original easy recipe is from Ina Garten, however I simplify it even more. Olive oil, parmesan, pine nuts. That’s it. Oh, and after that, a pinch of salt and pepper. As a result? We eat broccoli all the time now. It’s super delicious on its own, but I often take leftovers (or even roasted a batch specially for this reason) and mix them with quinoa, whole wheat orzo or another grain. My favorite easy dinner for myself is some chickpea pasta with this roasted broccoli tossed in. It’s SO good. And super filling. It’s easily the most made side dish in my house. This parmesan roasted broccoli is irresistiable and will turn even the biggest broccoli haters into broccoli lovers! Major flavor in this roasted broccoli! Preheat the oven 425 degrees F. Line a baking sheet with foil and spray with nonstick spray. Place the broccoli on the sheet and drizzle with the olive oil. Cover with the pine nuts, salt, pepper and parmesan. 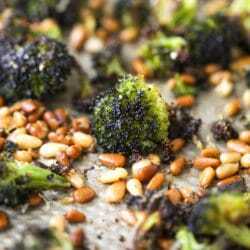 Roast for 20 to 25 minutes, or until the broccoli is golden brown and the pine nuts are toasted. After this time, the pine nuts may start to burn, so keep an eye on it! Remove from the oven and sprinkle with more parmesan if desired. Serve immediately. The crunchy bits are my fave! I’m 10000% here for Side Dish Sundays! Roasted broccoli is a favorite of mine (sorry, not sorry), so this parmesan version looks especially deeeeelicious – love the pine nuts inclusion. Love the idea of side dish Sundays! I make basically the same three sides all of the time. i do that too!! i’m so excited for the same reason. thanks diana! That sounds good! I’ve roasted broccolini with Parmesan and loved it! (From “Dining In” with lemon slices, too.) The pine nuts sound good and I’ve got a lot in the freezer to use up! 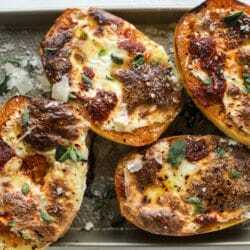 I love the idea of concentrating on side dishes. Amazing! I am definitely going to have to try this on my broccoli hating fiancé. If he still hates it, at least there will be more for me! Bring on the roasty, toasty broccoli! I love this new Side DIsh Sunday thing but dang, girl…you need to take at least one day of the week off! I have to admit, I love everything you post…recipes, your Tuesday musings, the Saturday posts, the stuff about the kids…all of it but I don’t want you to burn out. Just sayin’. Thanks for this recipe and for all you do! I am off to prep for your Roasted Gnocchi for dinner tonight! Great idea. I’m always looking for easy side dish ideas. Hubby and I love roasted broccoli. I’ll be adding pine nuts next time. This is going on this week’s menu. This looks amazing & if I get like going to the store in the slushy ice I’d make this tonight! Keep them coming! I love the idea for the new series. We love roasted broccoli. We will have to try this recipe! I’m not quite hungry now, so I’m making this yum.